Sculpture at some point is a hard art form for potential clients to want to own. Painting puts less demands on it's owners. Just put some wire and hooks on the back and it's ready to hang. With sculpture it is a little different. Most sculpture needs, nay demands, to be viewed-in-the-round. Viewing sculpture in-the-round becomes a floor space issue not a wall issue. Now the sculpture has become furniture/art situation not just a wall issue like painting. What your new sculpture is placed for display on on can be important. place for sculpture in your home or office. theme of the sculpture through to the pedestal. Design considerations for a pedestal are pretty open with just a few things to look out for. These would include: importance of pedestal, height of pedestal, use of color and wood type. The importance of the pedestal is an underrated item. The pedestal is subordinate to the sculpture but at the same time it's purpose is to make the sculpture glow. The pedestal should be unobtrusively pointing to the sculpture - particularly if the sculpture is of a low-key or taciturn disposition. If the sculpture has a more active character, the pedestal could have a bit more flair to it but not much. 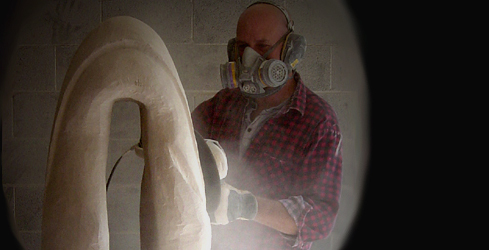 The pedestal's job is to display and hold up the sculpture so the sculpture can shine. The sculpture's job is not to hold the pedestal down to the ground because of it's wild design or color. pedestal, she did not want it to tower over her and run the chance of being menacing. level. Make sure that the pedestal has adjustable feet to compensate for uneven floors. Color in a pedestal should be used judiciously. Too much or too loud a mix of color and the pedestal becomes the center of attention not the sculpture. That said, pedestals should be of a darker tone, most of the time, but not black. Black is a tyrant of a color and will show any nicks and scratches quickly. If you are slightly finicky this will ensure many nights repainting the black pedestal. Muted wood stains with a good urethane top coat to paint are preferred. I find it adds a touch of interest to the pedestal without going overboard. Also avoid white. White is a color that your eye goes to immediately - not the sculpture. 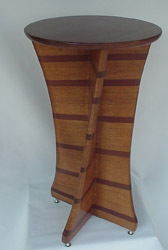 Serpentine Pedestal by Carl Wright 36" tall x 20" dia. birch, and mahogany also take stain well. Cherry does not stain evenly unless you have worked with it before and know how to accommodate it's shortcomings. At all costs avoid any pine, sycamore, and other softwoods. They dent very easily and do not take stain well at all. not only where to put the sculpture but on what. A table is a good choice, but make sure that it is stable and does not rock back and forth. The important thing is to love your new sculpture and where it is placed.